Intelligent Systems changed the world of tactical role-playing games forever with the Fire Emblem and Advance Wars series. While the former is enjoying continued success, which has only increased with the release of Fire Emblem: Awakening on the Nintendo 3DS, the Advance Wars series has been dormant for quite some time, which is a shame, considering it was more focused on tactical gameplay than the Fire Emblem series. If Intelligent Systems were to merge the two series, what would happen? 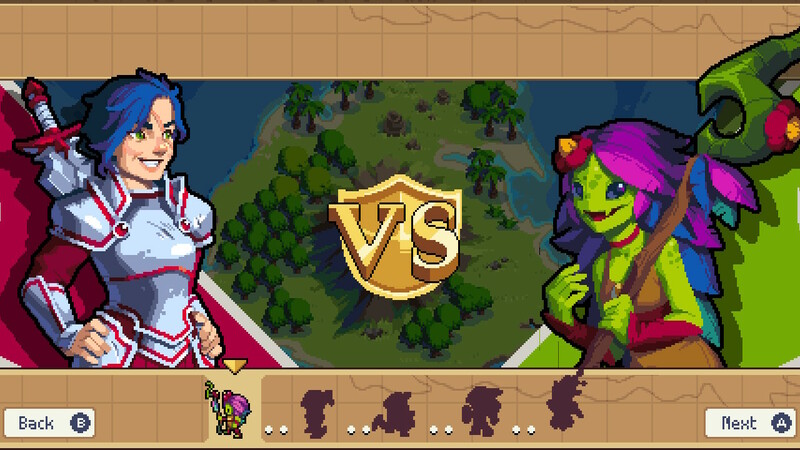 A game like Wargroove, most likely: the tactical RPG by Chucklefish manages not only to pay homage to the Advance Wars series, but it does so in the most stylish and solid of ways possible. What feels most impressive in Wargroove from the get-go is the huge amount of play modes available. Alongside the campaign mode, the game features an arcade mode, a puzzle mode and a map editor which allows players to create their own custom maps as well as full campaigns. Each mode is a full fledged mode, and none feel like pointless filler. On the contrary, they play off each other extremely well and help players quite a bit in understanding all of the game’s mechanics. 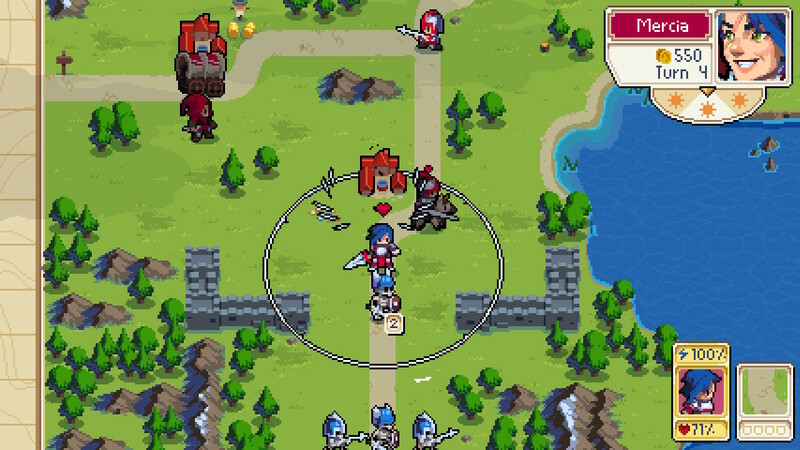 The main play mode of Wargroove is the Campaign, where players follow young queen Mercia of Cherrystone, who has to reclaim her kingdom after her father has been killed by the rival kingdom of Felheim. During her journey, Mercia will befriend rulers from other kingdoms, who will help her reclaim what is hers by rights, as well as people close to these rulers. While the main story is the classic tale of an exiled queen looking to reclaim her throne, the characters are extremely intriguing and well developed, both allies and villains. The world, even if it’s rather small compared to other big RPGs, is also well made and features some interesting lore behind it that makes it feel alive. Lore is not at the forefront all the times, but the game provides additional information through the Codex for those looking to get more in-depth with lore. What makes the story interesting, despite it being somewhat plain, is the way that it is told. Cutscenes using the game’s sprites are played before and after every single mission, and there’s also some dynamic storytelling through events happening during battles themselves. The sprites are gorgeous to look at, and the animations are just as beautiful. The unique character design also contributes to making these cutscenes extremely pleasing to the eye, especially to fans of old-school games. Wargroove is a tactical role-playing game through and through, but there are some very interesting features that make the experience quite enjoyable and, thankfully, grinding-free. The game employs a turn-based combat system where the two sides move their units on a variety of maps. Units in Wargroove don’t represent a single warrior, not counting Commanders, but a squad of five warriors. Units are extremely varied, ranging from regular infantry to archers, cavalry and so on. There are also vehicles, which can be used to transport units quickly from one point of the map to another. Each faction also has a slight variation on the basic Cherrystone units, which contributes to making the experience more varied, especially in Arcade Mode where players can choose their faction regardless of story events. 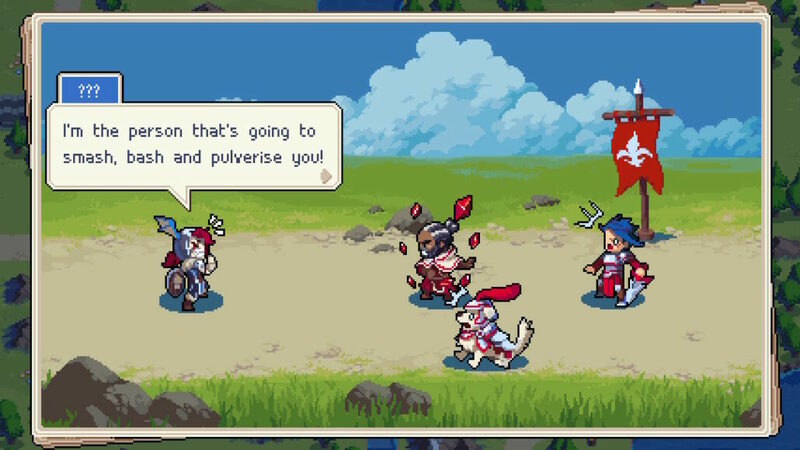 A very interesting gameplay mechanic which sets Wargroove apart from similar games is how critical hits are handled. Unlike many other RPGs, units can perform critical hits only when certain conditions are met. Regular spearmen can deal one if they have a similar unit near them, archers can deal one only if they don’t move at all during their turn and so on. Some of these conditions are extremely creative, which contributes to making all units very, very unique. The way Critical Hands work also leads to one more reason why Wargroove is such a good game: almost complete lack of RNG. Most tactical role-playing games these days rely on players grinding to succeed easily. This doesn’t happen in Wargroove at all. At the beginning of each story mission, players will start with their commander, who is way more powerful than regular units, and a select number of units. These units don’t have levels and enhancements, and their stats are always the same, meaning that only players making the right choices will emerge victorious. Units also deal less damage when they are damaged themselves, and all values are fixed, so there’s no chance of missing an attack or dealing less damage than anticipated: what is indicated on screen is what you will get. The total lack of RNG makes Wargroove an extremely involving game, as players not only have to make the right choices but must also manage units and resources wisely. While each mission starts with a limited number of units, it’s possible to recruit more units through barracks, which usually must be conquered by a faction first. New units, which are unlocked progressively as the game proceeds, can only be recruited with money, which is, in turn, only obtained by occupying villages, which will then produce money each turn. Villages and barracks can be lost to the enemy, so players not only have to work toward clearing the mission objective, but must also think about their defenses. If too many villages are lost, it’s almost impossible to get back on one’s feet. Speaking about mission objectives, Wargroove does a tremendous job in making each mission very different, as objectives are extremely varied and not so obvious quite a few times. Some of the missions featuring enemy commanders can be completed by taking them down, but good luck in trying to do so with regular units, as commanders can destroy them very easily. Special abilities that can only be used by commanders add another layer of depth to an experience that’s already extremely deep, involving, but also very satisfying. Terrain also makes maps more varied, as the type influences each unit’s defense. And if you find the game too easy for you, you can also try to get a full three-star rating for each mission. The main campaign is only the tip of the iceberg regarding the Wargroove content. Arcade Mode is a very interesting addition, which allows players to complete several missions one after the other almost like in a fighting game, complete with dialogues between commanders and short ending sequences. This mode is extremely fun to play, and also a very good way to learn more about the mechanics. Puzzle Mode is an even more interesting mode, which tasks players to complete specific battle scenarios in a single turn, something that further deepens players’ knowledge of the mechanics. The most extensive play mode outside of the campaign, however, is the Map Editor. As already mentioned, this editor allows the creation of single maps and even entire custom campaigns, complete with dialogues, branching paths, unlockable optional missions, and secrets. Creations can be shared with other players through the Sharing Center, regardless of the format. Needless to say, the ability to play custom campaigns extends the title’s length even further. If you haven’t had enough of Wargroove, you can also put your tactical skills to the test against other players in local and online multiplayer modes, which also come with full rule customization. There are also co-op modes for those who don’t want to play against others. The multiplayer modes are so well done and customizable that even those who are not keen on playing with others will enjoy them. There’s even cross-platform play between PC, Nintendo Switch and Xbox One. 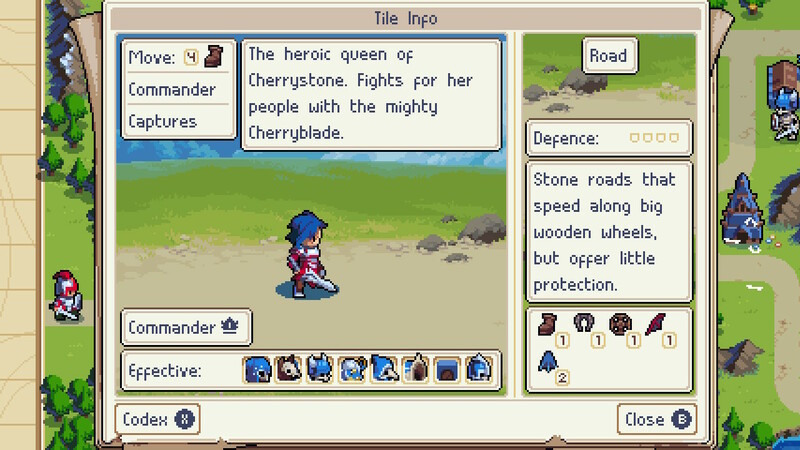 As mentioned earlier, Wargroove’s presentation is inspired by old-school tactical role-playing games like Fire Emblem and Advance Wars. Sprites are big, extremely detailed and wonderfully animated; backgrounds are colorful and quite nice to look at. The menu system is slightly complex, so it takes some time to get used to it, but thankfully, the game does its best to ease players into it gradually through the first story missions. The soundtrack is also inspired by old-school games and does its job well, and so does voice acting. Intelligent Systems may have moved away from a certain tactical role-playing experience, but thankfully Chucklefish not only picked up the torch but carried it way further with Wargroove. While the game has been inspired by classic Fire Emblem and Advance Wars, it would be reductive to define Wargroove as a simple spiritual successor. With its huge amount of content, solid mechanics and very high-quality, this is a game that fans of the genre should not pass for any reason. Nintendo Switch version tested (review code provided by the publisher). You can purchase the game for Xbox One and PC (Xbox Play Anywhere) via Microsoft Store. Wargroove is the game fans of tactical role-playing games have been waiting for. The huge amount of content and play modes, solid gameplay almost completely devoid of RNG and excellent presentation make it a game that no fan of the genre should pass on.